Today, I find that this is a common dilemma to most millenials, especially if you are currently working in the Klang Valley but are originally from out-of-town. Ideally, most of us believe that a property would appreciate in price while a car would depreciate in value over the long-term. With that said, depending on the nature of your job, background, and financial status, you may consider yourself a car first over a property. If that is you, please read on. In this article, I’ll share a simple method that you can use to buy both – a house and a car – in the shortest amount of time possible. The best part is: You do not need to sacrifice one for another. To use it, we must first understand a concept known as ‘Debt Service Ratio’. What is Debt Service Ratio (DSR)? Let’s use Sarah as an example. She earns RM 3,000 a month. If local banks adopt a lending policy which limits their lending to an individual where his installments are capped to a maximum of 60% of his monthly income, then, the maximum amount of installments she can afford is estimated to be RM 1,584 a month. The installments are a combination of multiple loans which include mortgages, car loans, personal loans, credit card debts, PTPTN … etc. Let us assume, Sarah intends to buy a Honda City as it looks better and safer as compared to an Axia. The price of her preferred model is RM 90,000. The nominal interest rate is 3% per year, hence, her monthly installment works out to be RM 953 a month based on a loan tenure of 9 years. You may estimate your car loan installments conveniently using calculator.com.my. If she opts for it, she would used up ‘RM 953’ out of the available ‘RM 1,583’ in monthly installments on her brand new Honda City. This leaves Sarah a balance of RM 631 which could be used to service a mortgage. Based on the Rule of 200, the maximum amount of mortgages she is eligible to obtain is RM 126,200. Hence, Sarah could shop for flats or apartments that are priced anywhere below RM 140,000 – assuming that it is her first property. Let us assume, instead of using the ‘RM 953’ for a Honda City, Sarah chooses to buy an apartment where her installment is RM 953 a month. Her loan amounts to RM 190,600. Her apartment should costs around RM 210,000 if Sarah is able to secure 90% home financing from local banks. Hence, the first advantage of Sarah deciding to buy a house first is – She would be able to buy a higher-priced property, hence, having more options to choose from in the market presently. What if Sarah Rents Out her Apartment? If she opts for it, she would used up ‘RM 953’ out of the available ‘RM 1,583’ in monthly installments on her apartment. This leaves Sarah a balance of RM 631 which could be used to buy her car. It is good enough for an Axia but she wants a Honda City. Here is the magic trick. If Sarah rents out her apartment for RM 800 a month, she would boost her net monthly income to RM 3,340 after deductions of EPF, tax, and SOCSO. Thus, Sarah would raise her maximum monthly installments to RM 2,064 from an initial of RM 1,584. After netting off her mortgage installments of ‘RM 953’, Sarah’s maximum amount of monthly installments after letting her apartment works out to be RM 1,111. The amount exceeds the installment for a Honda City of RM 953 per month. As such, like magic, Sarah is still able to buy herself a Honda City after investing in an apartment. Thus, if you wish to buy both a car and a house, one of the more efficient ways is to ‘First Buy a House, then Buy a Car’. There are many (now in their 30s and 40s), myself including, who applied this method and have became wealthier as compared to their peers who did not. 2 replies to "Which One Should I Buy First? 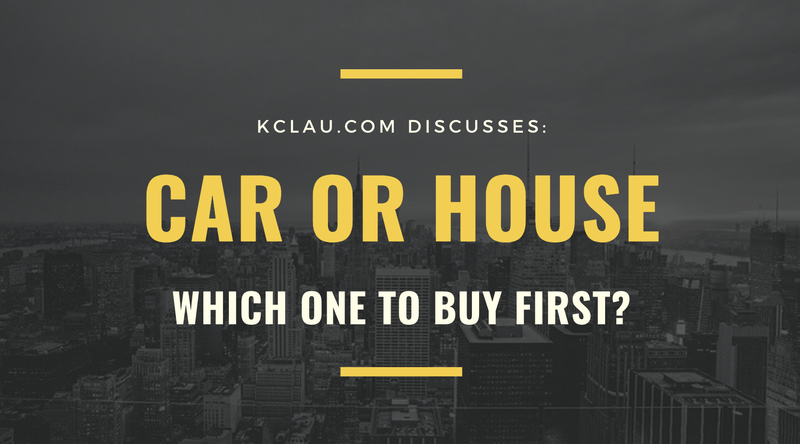 A Car or A House?" Hye Lan, thanks for the input. Now i see things clearly.